Ectomycorrhiza and lawns can cohabitate beautifully. Here's my picture of a beautiful group of Amanita muscaria var. 'guessowii' that I saw last October, in a lawn, beside a windrow of Spruce. And if you look real close - you'll see a fly on this 'Fly Agaric' These may not be good for people (or not, depending on what you get up to on the weekend) - but - they are very good for the roots of their host trees. They are ectomycorrhizal partners of all Pine, Spruce, Fire, Hemlock etc. So if you see them - don't pick them - the mushroom cap is the final stage of the reproductive cycle of this fungi. The cap doesn't last long, but each one produces billions of spores that will germinate in the spring and go on to assist their conifer hosts with finding water and nutrients in the soil. Ain't nature cool! Amanita is not in Transplanter MS-CS. This variety of ectomycorrhizae is not one of the 9 species in our Transplanter formulation. We were only allowed (by the CFIA) to include species that had no reported toxic or psychotropic effects on animals (or people). But that doesn't mean that it isn't good for its tree hosts - it certainly is. Both of these hard-working (and edible) Laccaria species are included in the Transplanter MS-CS formulation. The 'bicolor' was photographed by me in last fall - the 'lacata' in June. The lacata pic is from my back yard; the spruce that is benefiting from it's work is actually in my neighbour's back yard (root systems ignore property lines). You'll notice that my lawn is not a monoculture of turf plants - there's fungi, and broadleaf plants (including a nice crop of dandelions flowers every spring) etc. In the 6 years that we've lived in this house, I've never applied a synthetic fertilizer - and no chemicals have been applied on our lot either. Most years, no fertilizers were applied - when I did - it was an Organic Granular Formulation. I have never - ever - watered the lawn. The unattainable billiard table of of turf? When comparing our lawn to some of our neighbour's, it is not a 'perfect lawn' - I've shed the obsession to chase the unattainable billiard table of of turf. But - ours stays greener longer every summer - and our dogs can run around like maniacs without concern about what they might pick-up on their paws (which they obsessively groom after being outside). Also - I have my mower (a battery-powered Stihl) set at a Medium Mowing Height. The close-cropping of turf is not good for those plants, they can even self-seed when they like. 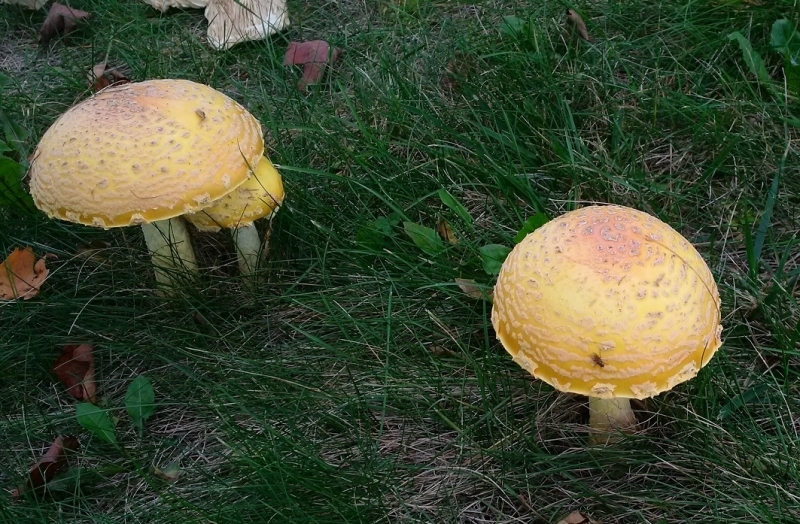 And raising the mower height allows for other types of flora (and Fungi) to take up residence in my lawn. 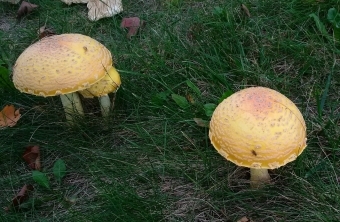 Notably, the mushroom caps of the Laccaria (shown above) are below the height of my mower blades - so they are not harmed by the mow, and can ripen and shed their payload of spores. All of which helps my neighbour's Spruce tree. I'm lazy - I never rake-up clippings - the mower is set to mulch it all up - and turf clippings are about 3% Nitrogen, so why haul them from the lawn? BTW - my back yard is dominated by afternoon shade from a big old Walnut tree on our West property line. So there's competition for moisture, Juglone, and shade to contend with. All in all, I'm happy with my "All-Natural, 'Flattish, Green Groundcover" (that a 'purist' would not call a 'lawn'). The neighbours (who look over the fence) ask me every August "why is your lawn still so green?"